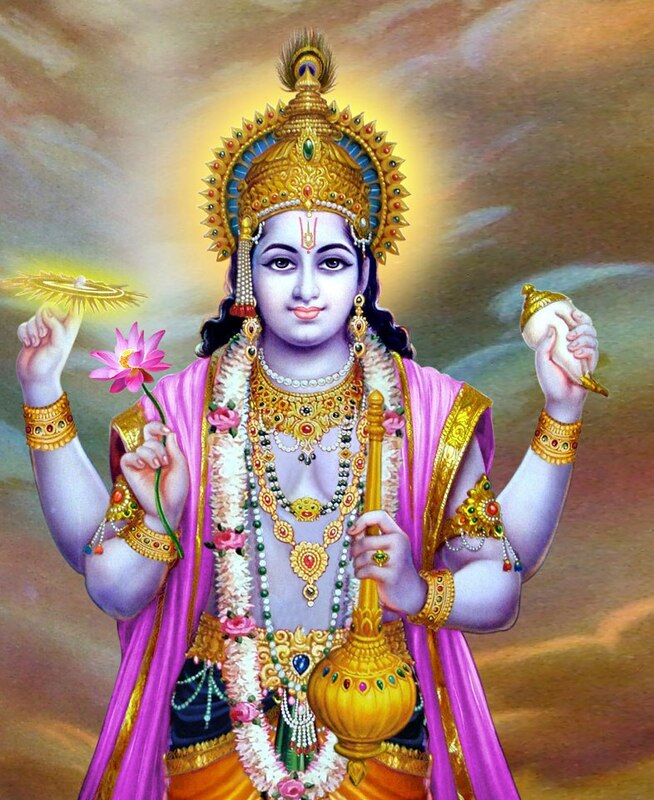 In this Part, we will explore the meaning of the 19th Shloka of Sri Vishnu Sahasranamam. Bhagavan has infinite knowledge and he performs all his acts effortlessly. He has immense power and remained unchanged or does not decay. He is the not only the brain behind the Creation but He is also the cause of the Universe. He is endowed with effulgence and he is the brilliance that makes the Sun shine. He is indescribable and cannot be known with the limited senses of humans. Lord Narayana possesses all the divine attributes of Lakshmi as He has Shri in his ‘Vaksha Sthala’ (chest). He cannot be measured or inferred by other beings and he bears the burden of his devotees and comes to their rescue in their hour of distress. 175. MahaBuddhih – One who has infinite knowledge. Sri Adi Sankara explains this term as ‘Buddhimataam api buddhimattvaat Mahabuddhih – He is intellectually sharper than the sharpest’. In the Bhagavad Gita Chapter 7 Verse 10, Bhagavan says ‘Buddhir buddhimataam asmi – I am the intellect present in the intellectuals’. Sri Parasara Bhattar points out that HE is MahaBuddhih because His knowledge does not depend on His sense organs or any external help. 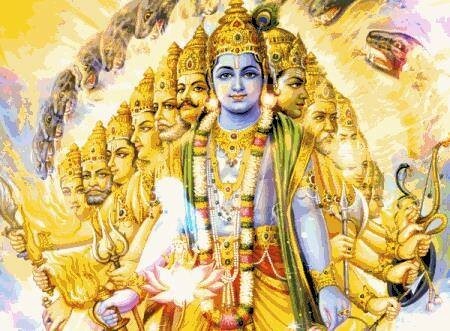 Vishvatashcakshuruta vishvatomukhah – He has eyes on all sides and faces on all sides (Taittriya Narayana Upanishad 1.12). Bhagavan is the Buddhi behind the functioning of all His creations and so He is the collective sum total Mahabuddhih. Sarvato’kshi Siromukham – He has eyes, heads, mouth everywhere (Bhagavad GIta 13.13). Acharya Nathamuni says – ‘Yo vetti yagapat sarvam pratyaksheNa sadA svatah – HE sees directly by perception and of His own accord all things simultaneously’ (Nyayatatva). The dhaatu word from which the name is derived is ‘budh gnane’ meaning to know, to understand. Bhagavan is the Buddhi behind the functioning of all His Creations, and so He is the MahaBuddhih. Sri Satyadevo Vaasishtha points out that the behavior of each and every entity of the Universe is indicative of the knowledge that He has invested in them. The establishment of the stars and the planets in their respective positions and orbits is a striking example of the great intellect or MahaBuddhi of Bhagavan in action. Shri Radhakrishna Shastri points out that Buddhi is the most important of the four antahkaranas or the inner faculties of the human being. Buddhi chooses between the options provided by ‘manas’ (mind), taking into account the memories of all previous experiences provided by ‘cittam’ (thought), before ‘ahamkaram’ (ego) takes over and executes the action. If the Buddhi makes a poor choice, it is a sign of an alpa-buddhi or a petty intellect. If the Buddhi always makes noble choices, then it is MahaBuddhi, which is what Bhagavan epitomises. The magic of creation of the multitude of beings and their being held together as a functional entity is beyond the knowledge of anyone else but Him. 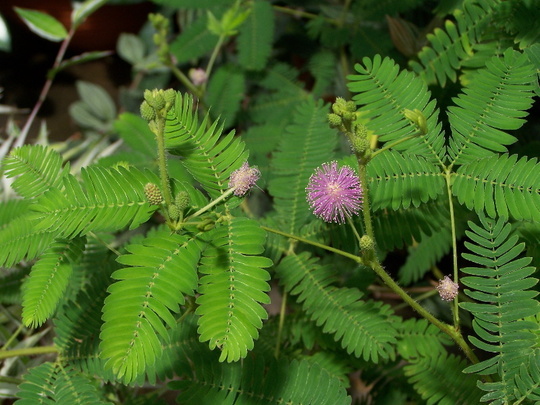 HIS MahaBuddhih is evident in many things we see like the spider spinning its web or the “lajwanti” plant, also known as “Thotta Siningi” in Tamil, which wilts on touch are all examples of the wonders of his jnAna that is the Maha-Buddhi. The Dharma Chakram published by Sri Ramakrishna tapovanam, gives the example of a crow’s behaviour. When a crow is chased by a small child, it just displays minimal effort to get away. If a grown-up person chases it with a stick, it takes just a little bit more effort to fly. If a person with a gun appears, the crow will be nowhere to be seen. Only the MahaBuddhi could have given the crow this level of intellect, which further gets transmitted in an unending chain demonstrating the knowledge He has invested in His creations. He is MahaVeeryah because HE remains unchanged unlike everything else which changes with time. Just as flowers give out their fragrance to all their surroundings with no effort on their part, Bhagavan performs all His acts with little effort, and this is an indication of His Veerya. Sri Adi Sankara says – ‘Jagadutpatti Kaaranam Avidyaalakshanam Veeryam asya iti Mahaveeryah – The unknown force behind the creation of this Universe is nothing but an evidence of the great virility of Bhagavan. Swami ChinmayAnanda points out that Veerya is the essence of all dynamism or creative urges, and He is MahaVeerya because He is the driving force from whom alone all the dynamism for creation can manifest. Sri Radhakrishna Shastri explains that Veeryam is the quality of achieving one’s objective no matter how difficult it is. Bhagavan’s first accomplishment, the creation of this Universe from the prakriti or primordial matter, is a result of His Veerya. In the Vyakhyana in Dharma Chakram it is pointed out that one with Veerya or the creative energy should also be one who has complete control of the Indriyas in order to transmit this creative energy to the benefit of everyone else. Viewed from this perspective, the Lord is the only one who can be called the MahaVeerya. Sri Adi Sankara describes the basic meaning as ‘Mahatee shaktih saamarthyam asya asti iti Mahashaktih meaning He is MahaShaktih because He is the great storehouse of energy with the power to act and has the necessary skills for such actions. Sri Parasara Bhattar points out that the name MahaShaktih emphasises that Bhagavan is not just the sentient cause of this world, but is also the material cause of this world, i.e., HE is not only the brain behind the Creation, but HE is also the cause which resulted in the physical creation of this world from the prakriti. Swami ChinamayAnanda follows up on this and indicates that He is MahaShaktih because He is the cause of the interplay of the three Shaktis, the Kriya Shakti (power-of-action), the Iccha-Shakti (the power-of-desire) and the Jnana Shakti (the power of knowledge). All these three powers go into the creation of the Universe. Just like a spider produces a web from within itself, the Lord creates the world from within HIM. Sri Satyadevo Vasishtha interprets the meaning of this nama to be similar to MahaBala, MahotSaahah etc. As pointed out under the previous nama, He uses the mighty power for the good of the world, and every instance of this might should remind us of His MahaShaktih. Sri Adi Sankara defines this as ‘Mahatee dyutih Baahyaabhyantaraa cha asya asti iti Mahadyutih – He is endowed with great brilliance both internally and externally’. The derivation of this Nama is from dhAtu dyuta deeptau means to shine. Dyotate iti dyutih means One who is shining. Dyutih, dyotayitaa vaa dyutih – One who makes things shine is Dyutih. JyotishAm jyotih meaning The Light among lights (Mundaka Upanishad 2.2.9). Sri Radhakrishna Shastri points out that a total of 43 names in the Sri Vishnu Sahasranamam start with the word ‘Maha’. Of these, the last six namas refer to Bhagavan’s qualities of overlord, strength, knowledge, virility, power, and effulgence. The combination of these six qualities is what makes Bhagavan the Mahamaaya or the One who performs the wonderful acts, which are His sport or Leela. The name of this Azhwar comes from his birthplace, Thirumazhisai, a suburb near Chennai. He was born to Bhargava Maharishi and his wife Kanakangi after an unusual pregnancy term of 12 months. The foetus came out as a lifeless lump of flesh with no arms and legs. The couple were terribly depressed and with a heavy heart reluctantly left it under a bamboo bush and proceeded on their spiritual journey. Lord Vishnu appeared with his consort and blessed the “flesh” with their Divya Kataksham and gave it life and a beautiful infant was born. He was later picked up affectionately by a tribal named Thiruvalan. A really blessed couple Thiruvalan and Pankaja Chelvi, were overwhelmed by the grace of God for this Gift of a Swarna Vigraham (Golden idol) like baby. However, they were depressed by an unusual phenomenon of the child not drinking milk or eating food or expelling any waste. This news spread and a lot of people visited them to be blessed by this divine child, who was developing like any other child but without any intake. One day a simple looking, devoted elderly farmer couple paid them a visit and they had brought some cow’s milk with them. The lady affectionately placed the baby on her lap and offered the milk saying “Oh our beloved ThirumazhisaiyE, the one who came amidst us by the grace of Sriman Narayana, please take this milk and remove our worries, dear” and the baby started to drink! After that day, they went regularly to offer the milk to the baby; and on one such occasion the baby Azhwar signalled the elderly couple to drink the left over milk. The moment they drank the milk, they regained their youth; a miracle by the Divine Azhwar, who was none other than ChakrAyudha (an avatar of the Sudharsana Chakra or Discus of Sri Maha Vishnu). The “young” couple were later blessed with a male child called “Kanikkannan” who became a close friend and an ardent disciple of Thirumazhisai Azhwar. Thirumazhisai Alwar decided to learn about other religions and studied Buddhism, Jainism, Saivism and other literature. Much later, PeyAzhwar debated with him and showed him evidences from Vedas and Smrithis. 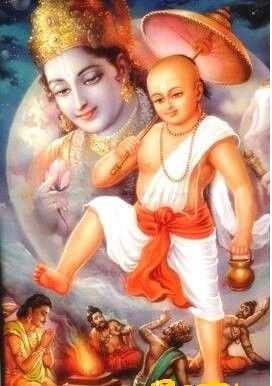 He finally initiated him to the Vaishnavite philosophy and named him Bhaktisaarar. Meaning: We had learned Saakkiyam (Jainism), SamaNam (Buddhism) and the Agamic Scriptures by Lord Shankara (Shiva) and due to sheer grace, we landed at the feet of Thiruvengadathaan. 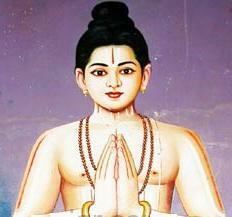 Kanikkannan, too joined Bhaktisaarar and served him as an ardent disciple (Sishya). There was also an unmarried elderly lady who was very devoted and served the Azhwar whole heartedly. AzhwAr was greatly impressed by her indefatigable service and devotion. He appreciated her profusely and the lady was moved and regretted that she joined him at this old age. Lamenting she was unable to join while young which would have allowed her to serve him for many more years. Hearing this, Azhwar’s kind heart melted and he showered his grace (Kataksham) on the lady, who was immediately transformed into an extremely beautiful young lady. 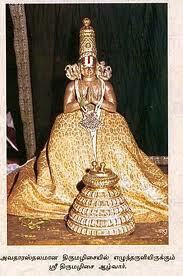 A few years later, during a “Nagarvalam” (procession), the Pallava King saw her and married her. After some years, when the King noticed that his queen was not ageing and reamained youthful while he was aging, he found out that it was due to Azhwar’s Divya Kataksham. The King summoned Kanikannan, the disciple of Azhwar, to the court and asked him to make a request to the Azhwar to grant him youth and sing in his praise. 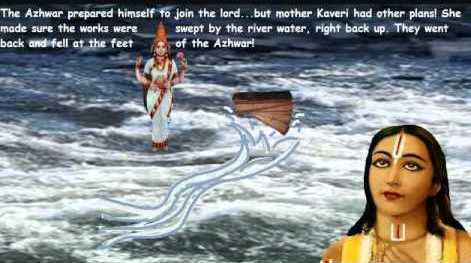 Kanikkannan refused saying the Azhwar and he will not yield to such a request. The enraged King ordered banishing Kanikkannan from his kingdom. Kanikkannan said “this is not the only Sthalam for me; the entire world is His” and left. He went to the Azhwar and narrated the incident and begged for his pardon for leaving him; Azhwar felt very sad that his dearest friend/devoted disciple is about to leave him. He did not feel like staying there without Kanikannan. Hence, Azhwar too decided to leave Thiruveka. Azhwar went to the temple and prayed wholeheartedly with tears in his eyes and requested the Lord also to come along with them, as he cannot think of living without the Lord. The King learnt the following day that the temple is desolated and the entire city looked dark and lifeless. He understood his folly and rushed immediately looking for the trio. He prostrated on the ground, repenting for what he had done and requested them to forgive him and to come back to Kanchi. AzhwAr and Kanikkannan, understanding the sincerity of his remorse and repentance requested the Lord again to return and stay at Kanchi. Needless to say, the Lord obeyed. Meaning: Kanikkannan is going back to Kanchi Manivanna, I am also going back with him. You don’t have to lie down here anymore; Please you too roll your “naagam” (serpent bed) and follow me” and lo and behold, the Lord followed the Azhwar with the snake rolled and tucked under his arms back to the Temple. The greatness of Azhwar and the love or Vaatsalyam of the Lord towards the Azhwar to listen and obey the Bhakta’s request is surreal. Once on his way to Tirukkudantai, he stopped for a while to take rest and he sat on the “Thinnai” in front of a house in Perumpuliyur. A few Brahmins were reciting the Vedas inside that house. On seeing the Azhwar (deemed a lower caste), they stopped their recitation since, as per their tradition, Vedas were not recited in the presence of a person of lower caste. 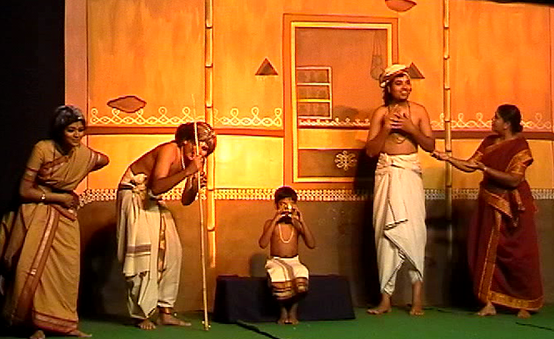 Azhwar immediately understood and was about to leave when the Brahmins started their recitation again. But they forgot the next line and got stuck when the Azhwar symbolically broke open a paddy seed that was lying there with his fingernail to indicate the context with which the Vedas was being recited. The Brahmins were astounded and realised the greatness of the Azhwar and sought his pardon and regained their memory of the Vedas. Meaning: What is the use of your having those resplendent hands if you cannot remove the idiosyncrasies of these ignorant folk and make me powerful in their midst? Lord, with the divine discus in your hand! Teach these fools a lesson by showing yourself appearing in my very physical body. Again, the Lord obeyed the Azhwar and showed himself off in the body of Azhwar and the protestors were simply astonished and prostrated and begged for his pardon. It only goes to prove, once again, that no one is superior or inferior by birth; it is just bhakti and love for Him that will make us dearer to Him. No one chooses his kulam, parents, life; it is all His mercy. 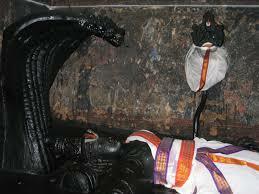 Once Thirumazhisai Alwar went to have a darshan of Aravamudhan Perumal in Kumbakonam. He was very much impressed by his beauty and wanted to have a chat with the Lord. So he prayed to the Lord and after some time, the Lord answered his prayer and started to lift his head from the sleeping posture to get up. 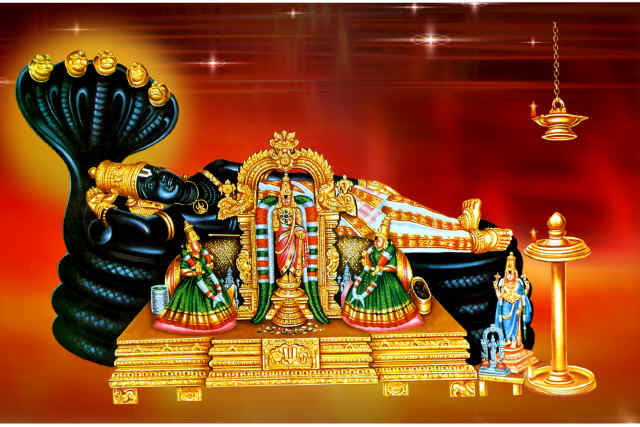 But, Azhwar did not want to disturb his sleep and hence he requested the Perumal to remain in the same posture and bless each devotee visiting him as he would bless the Azhwar. This posture of AravaMudhan is called as Uthra Sayanam and thus called as Uthanasai. The great gnanis’ never considered themselves as born until they become realised souls. And, once they realise, they have no other avocation other than being immersed in the thought of the Lord. He became an exemplary Sri Vaishnava Acharya and spent many years meditating on Tiruvallikkeni Parthasarathy Perumal. The Dharma Chakram explains that those who worship the Lord are naturally blessed by the Lord with a part of this Dyuti (The face is the index of the mind – agattin azhagu mugattil teriyum is the Tamil saying). Nirdesha is to define with certainty. So Anirdeshya refers to something, which cannot be defined or classified with certainty. Vapuh means shareera or body. So putting these terms together Anirdeshyavapuh means someone whose body cannot be described or defined with certainty. Sri Adi Sankara says effusively ‘Idam taditi nirdeshtum yat na shakyate parasmai svasamvedyatvaat anirdeshyam vapuh asya iti Anirdeshyavapuh – He is the one, whose body cannot be identified with any known object; Only He knows it and nobody else’. In the Lalita Trishati we also have ‘Etat taditi Anirdeshya’ as one of the 300 names of Lalita. All beings with a body, as we know it, are formed from the 5 elements namely, Earth, Water, Air, Fire and Space. Bhagavan’s body is quite different as it is formed from the six MahaGunas of Gnana (Omniscience), Aishvarya (Sovereignty), Shakti (Power or Energy), Bala (Strength), Veerya (Vigour) and Tejas (Splendour). He becomes whatever He wants to become. He is pure effulgence, pure knowledge, pure power, pure lordship incarnate, etc. In the Vishnu Purana, we have “rUpa varNAdi nirdeSa viSeshaNa vivarjitah – Regarding His form, colour, etc., there is nothing that can be compared to them” – (1.2.10). Shri Radhakrishna Shastri remarks in his commentary that the MahaGunas cannot be visualized by the meager knowledge that we possess, and it is only by the inner experience that He can be realised. Swami ChinmayAnanda points out that He is the knowledge through which we can describe everything else, but He himself cannot be described. 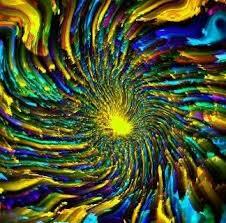 (To give a parallel, the eye can see others, but the eye cannot be used to see itself except through reflection). Sri Satyadevo Vasishtha uses this latter approach and gives a meaning for AnirdeSyavapu as One who cannot be easily described and it is HE who plants the seed for this Universe. He indicates that the word baap, baapu etc., father in Hindi is derived from a colloquial derivative of Vapu. Sri Adi Sankara defines this as ‘Aishvarya lakshanaa samagraa shreeh yasya sah Shrimaan – He has all the divine attributes which pertain to godliness’. The word Shri has several meanings. It means wealth, beauty, divine attributes and Lakshmi. Shrimaan also refers to Sriyah pati, or the Lord of Shri or Maha-Lakshmi. Bhagavan’s beauty is natural to Him because He has Shri in his vaksha-sthala. 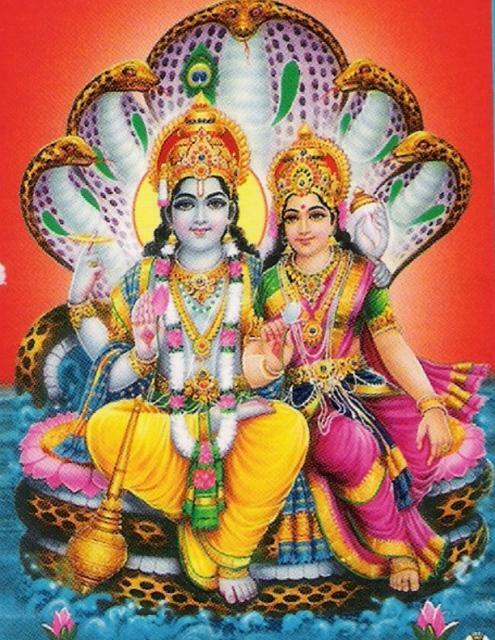 The name Shrimaan appears 3 times in the Vishnu Sahasranamam. Each occurrence is interpreted in the context of the name that precedes it. For this nama, since this immediately succeeds the description of the body of the Lord (anirdeshya vapu), they interpret it in this context, and give the meaning that it refers to the enormously beautiful ornaments that decorate the body of Bhagavan (per Sri Parasara Bhattar), or they refer to the beauty associated with the six great gunas or qualities (per Sri Adi Sankara). Sri Satyadevo Vasishtha gives the root as “Shri -sevaayaam” – One who is fit to be served. Shri also means Shobha or beauty or “Kaanti”. He points out that the beauty that is seen all around us in the trees, the birds, the rivers, the flowers, the Sun, the Moon, the stars, etc., should remind us constantly of Bhagavan, the Shrimaan whose Shri is shining in everything. Shri also means wealth. The wealth that humans have is transient, and can disappear any time. But Bhagavan is Shrimaan whose wealth is everlasting and eternal. The Dharma Chakram explains this Nama to mean that the prakriti and purusha are inseparable, just as Shri and the Lord are inseparable, and are part of the same para-brahmam. The root is ‘maa maane’ meaning to measure or infer. Based on this Sri Adi Sankara says ‘Sarvapraanibhih ameyaa buddhih Aatmaa yasya sah Ameyaatmaa – His intellect or self cannot be measured or inferred by other beings’. Sri Parasara Bhattar explains that based on the six gunas of the Bhagavan described in the previous namas, He is Ameyaatmaa or a person of incomprehensible nature. Sri Satyadevo Vasishtha starts from the root or dhAtu from which this Nama is derived – Ma mane means to measure or to compare with. Maatum arhah meyah; na mAtum arhah ameyah – Here AtmA refers to the SvarUpam. Since He is the inner oul of everything and it is not possible to describe Him from outside, just as an ocean cannot be precisely defined when you are in the middle of the ocean. MahaDridhrit means someone who carried a mountain on his head. There are two instances of Bhagavan bearing the mountain. The first one was the instance of HIM bearing the Mandara Mountain during the time of churning of the Milky Ocean. The Bhagavan appeared in the form of a giant tortoise to bear the churning stick (which was the Mandara Mountain) on His back. 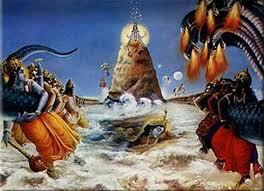 The second instance is when Lord Krishna bore the Govardhana Mountain in Gokulam to protect the cows and cowherds. Swami ChinamayAnanda points out that Bhagavan also supports the mind and intellect of the devotee when a devotee is churning his/her own milk-like pure heart of devotion, through shravana (study) and manana (reflection) in order to gain the amritam (nectar) of salvation i.e. Moksha. Some versions of Sahasranamam have this Nama as Mahadridhrik instead of Mahadridhrit. Mahadridhrit means One who bears a huge mountain (Mahadrim dharati). So, the difference in the meaning is very minor and both the namas convey that Bhagavan comes to the support of his devotees during their moments of distress. Bhagavan has infinite knowledge and he performs all his acts effortlessly, hence He is MahaBuddhih. He is MahaVeeryah because HE remains unchanged unlike everything else which changes with time.HE is the not only the brain behind the Creation but HE is also the cause of the Universe, so He is MahaShaktih. HE is endowed with effulgence and he is the brilliance that makes the Sun shine, hence He is MahaDyutih. 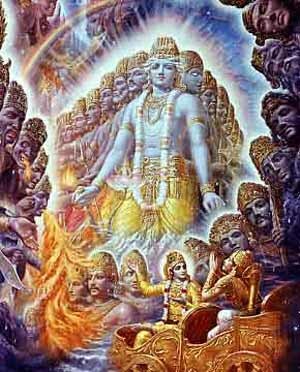 He is indescribable and cannot be known with the limited senses of humans, so He is Anirdeshyavapuh. 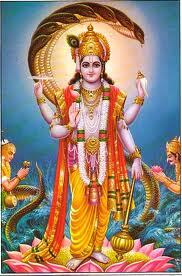 He possesses all the divine attributes of Lakshmi as HE has Shri in his vaksha sthala and hence He is Shrimaan. HE cannot be measured or inferred by other beings, so He is Ameyaatma. 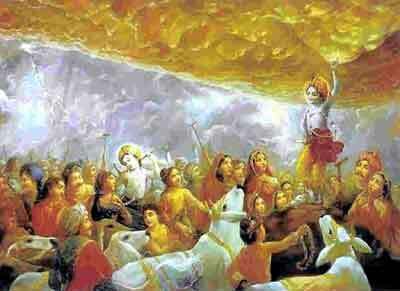 He bears the burden of his devotees and comes to their rescue in their hour of distress and hence called Mahadridhrit. Good morning to both of you! What a blissful narration. I love the ref stories of the handsome Thirumazhisai Alwar which is very intent. I am waiting to see your youtube post for the tamil Pasurams because I read tamil with a lot of difficulty & might get it all wrong. May the Lord bless you both with Love & Joy in your heart & peace in your Home for spreading faith which according to me, “Faith is the wind beneath the wings & without which no birds can fly. Thank you! Hari Om! Amen! Thank you for your kind words. I will be uploading the Youtube by mid-week. Thanks for your patience. Hari Om. Amen.